In reality every AMA Rescue dog is a success story. 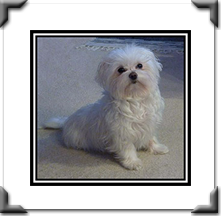 All rescue Maltese desire and deserve to have a forever home. 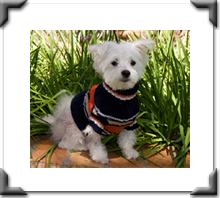 The photos and stories of the rescue dogs featured in this section represent some our rescues with complex health problems or injuries as well as some of our older Maltese. These are just a few of our successful placements. You saved my life and changed my world. You have given me hope where there was none and allowed me to love again. 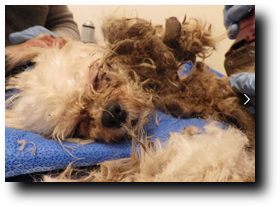 You were able to see what laid beneath the matted, feces covered hair. You were able to see behind the clouded eyes and see my beautiful soul. When the rest of the world was ready to let me die, you rushed to the shelter to save me. You hugged me and held me close, even though I smelled so terribly bad, and you promised me that everything would be okay. You brought me into your home...Now my home too. You cleaned me and made me feel so much better. For the first time in so very long my tummy was full and I slept in peace feeling safe again. And, still, you haven't left my side and you have not stopped letting me know that I am loved. My eternal and loving thanks to each and every one of you that Donate, Foster, and Volunteer for American Maltese Association Rescue. Thank you all for the precious gift of Life that you have given me. It is amazing that it was only two months ago that we rushed to the U.S./Mexican border to pick up Fluffy in the Chula Vista Shelter. 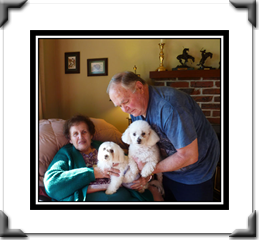 We were pleased that Dr. Cambridge and his surgical staff waited for us to get Fluffy to their hospital as quickly as we could on a Friday afternoon in heavy traffic. Fluff had a broken hip and pelvis so extensive surgery was done. Fluffy was well cared for by Dawn Isley who followed all of the rehab recommendations. It was amazing how soon Fluffy was taking daily walks as confinement was not part of her rehab. Seven weeks after her surgery, Fluffy was walking nearly all of the time on four legs and was cleared for adoption. This week Fluffy was adopted. Fluffy is pictured with her new mom, Lois Baldy. Snuggles was rescued from a large, overcrowded Southern California shelter. This gentle dog had been in the shelter for over a month and in danger of being “put down” when a concern person requested out assistance to acquire Snuggles as an AMA Rescue. It took the shelter staff 3 days to locate the correct dog and to facilitate his release. On the day of his release his foster mom, Kathy Doan, became very concerned about his respiratory distress and took him immediately to an emergency hospital. Snuggles was hospitalized with a diagnosis of double pneumonia and a compromised immune system. He was treated aggressively with antibiotics and plasma, and three days later he began to improve. It took Snuggles several months to recover, and he was recently adopted by the family who had requested our help in getting Snuggles out of the shelter. His new adoptive father flew to Southern California to bring him back to their home Washington. Snuggles is very happy in his new loving home. Bugsy was one of a large group of dogs rescued from a puppy mill. He was the least social of the male dogs, but he was adopted when he had made minimal social progress as his adoptive family immediately established a bond with him. 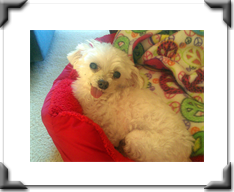 Today Bugsy is a totally happy and social Maltese residing with his adoptive family. He gets very excited when family members or guests enter the home by running in circles around them, but then he flops on his back in front of a person for his belly to be petted. Bugsy no longer tremors when he is held in someone’s arms. One of his favorite things to do is to go for a walk so when Bugsy hears the word “walk” he quickly gets in position to have his harness applied. This ex-puppy mill dog thoroughly enjoys each day with his loving adoptive family. 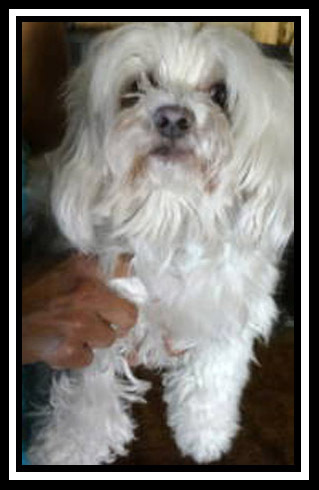 Fendi, a previous Special Angel, was surrendered to us when his previous owner, a disabled man, died. Fendi was very partial to men as he cherished his fond memories of his previous owner. 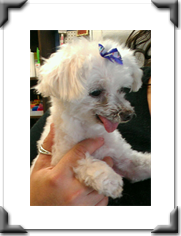 This little dog suffered with urinary tract infections and kidney stones. Surgery was performed to remove his kidney stones. When Fendi was fully recovered he was listed on Petfinder.com. 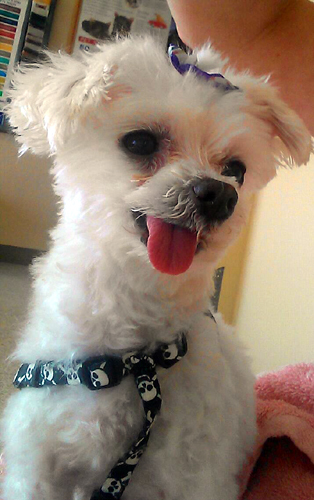 When a man inquired about adopting this little dog, we were excited for Fendi. 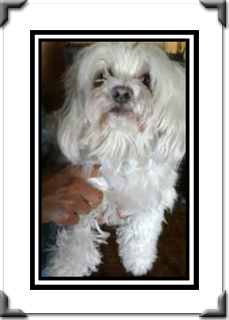 Out of state coordination was again required as Fendi was residing in a foster home in Fallbrook, CA, and the family interested in adopting Fendi resided in Washington. Thanks to Sharon Binger, West Coast Coordinator, a home visit was done and approved. Fendi flew with Richard Crowe to Portland, OR. This trip was made possible by donated miles from Mike Wootton. Sharon met Richard Crowe and Fendi at the Portland, OR Airport. Fendi was then transported by Sharon to meet his new adoptive family. 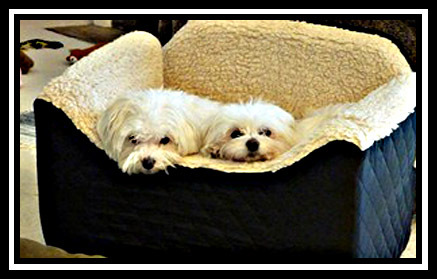 Today Fendi enjoys his life with his new family and a Maltese sister, the same age as Fendi. 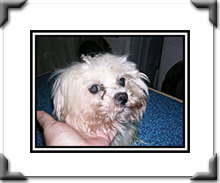 Prince a 16-17 year old Maltese was acquired from a shelter. 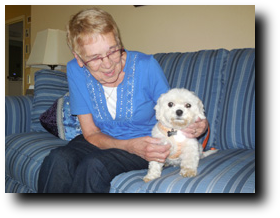 This senior has diminished hearing and eyesight. AMA member, Sarah Stangeland opened her home and heart to this older fellow. Prince navigates throughout her home, but prefers to stay close to his soft bed in her kitchen. 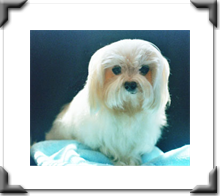 Sarah says the only difference in his care vs. her younger Maltese is to speak louder when talking to him and to keep an open path to the outside when Prince wants to go out. 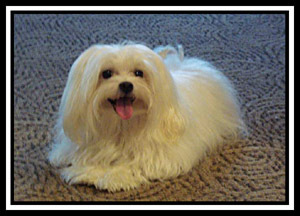 The second photo, taken after several months of loving care, shows a very stunning Maltese. Porsche, our 4-year old poster boy was surrendered by his family to animal control. The shelter contacted AMA Rescue to accept Porsche as he had a large tumor (testicular Cancer). This little guy was immediately taken to a Veterinarian Hospital for surgery. Luckily his tumor was localized so his prognosis was good. His recovery was lengthy with hormonal changes causing the loss of his body hair. Porsche also suffered separation anxiety when he was left alone. His first adoption failed due to his anxiety so we knew we had to find a special adoptive home. After 6 months without finding an adoptive family, Porsche flew with a rescue family member to the Pacific Northwest. Within 6 weeks, AMA Rescue Coordinator, Sharon Binger found Porsche a perfect adoptive family of 3 adults and someone at home all of the time. 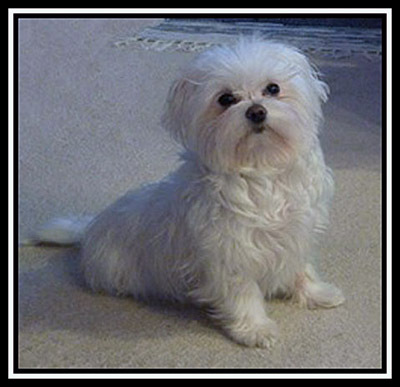 Rebekah, a 7 ½ year old Maltese, was surrendered by her family as small children in the household were continually tormenting her. During foster care it was found that Rebekah had low thyroid for many years so she was immediately started on thyroid medication. 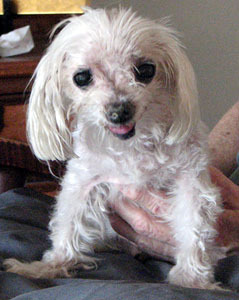 After several months in foster care, Rebekah was a happy, perky 6 ½ lb. 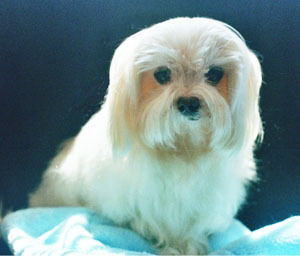 Maltese with a lustrous coat. 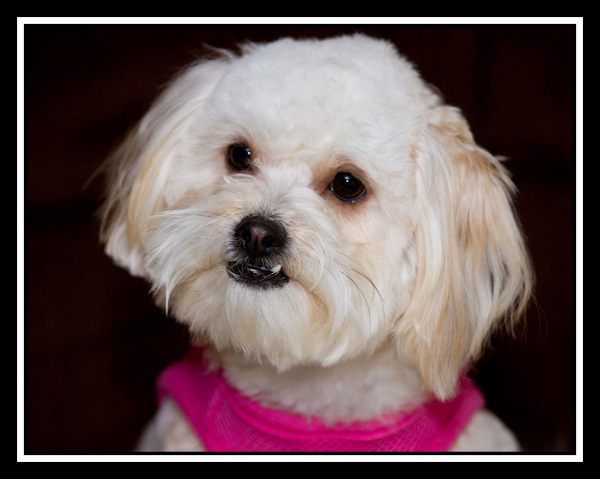 In Spring 2012, Rebekah was adopted and her new family is thrilled to have her as a family member. 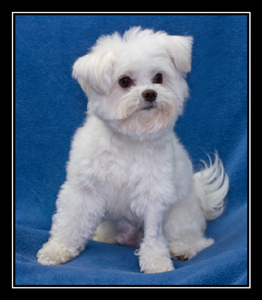 This is the family’s third Maltese, but the first rescue Maltese. 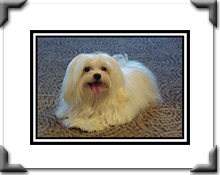 In the words of her adoptive mom, “What a little charmer, so eager to please and so in need of love.” Rebekah’s Maltese brother, Isaiah, immediately accepted her and adores her companionship. The photo of Rebekah and Isaiah was taken 10 days after her arrival as the pair bonded immediately. Although Rebekah, now 8 years old, might be considered a senior, she doesn’t have any trouble keeping up with Isaiah in play or on walks. 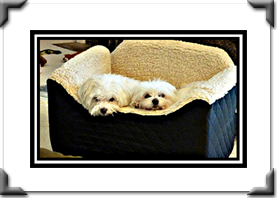 Foster mom Ileen is delighted with her two Maltese family members, and she has been surprised and amazed at how much joy and fun two Maltese provide. Jacqueline was evaluated last month at the Eye Care for Animals Clinic in Pasadena by Dr. Hoffman, an expert on retinal eye problems. After two visits, Dr. Hoffman determined that Jacquelyn’s remaining eye was so badly damaged that her vision could not be restored. The happy, playful 6 month old has adapted beautifully and freely moves freely throughout our home and yard. People meeting Jacquelyn for the first time are amazed by her normal behavior and actions, and often question whether she is really blind. Best of all Jacquelyn was adopted on March 6, 2013. 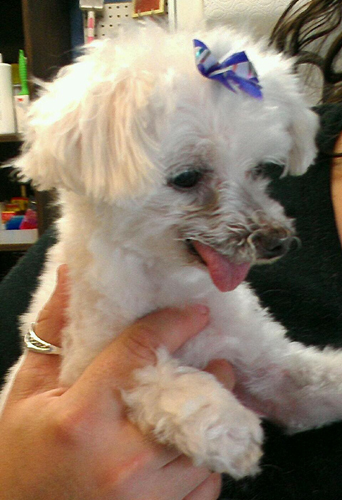 Sweetie Pie was adopted last month by a family with another Maltese rescue. 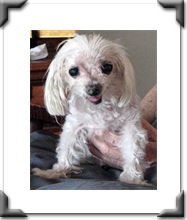 This family resides in the San Diego area and will be able to get follow-up care for Sweetie if she needs it. In January Sweetie had a successful cardiac procedure to completely repair her small heart defect. She recovered remarkably fast and is now racing around her foster home and playing with other young dogs. This sweetheart really lives up to her name as she radiates happiness and affection to everyone she meets. Sweetie Pie was surrendered by her owner as she could no longer care for her due to poor health and advanced age. 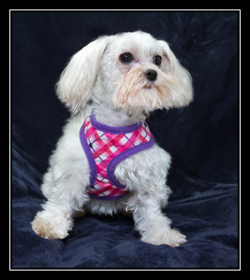 Sweetie is a 3 year old Maltese with a Grade 6 heart murmur. She recently was examined by a Cardiology Veterinary Specialist and had an echocardiogram. This exam showed that Sweetie has a Patent Ductus Arteriosus with an enlarged heart. 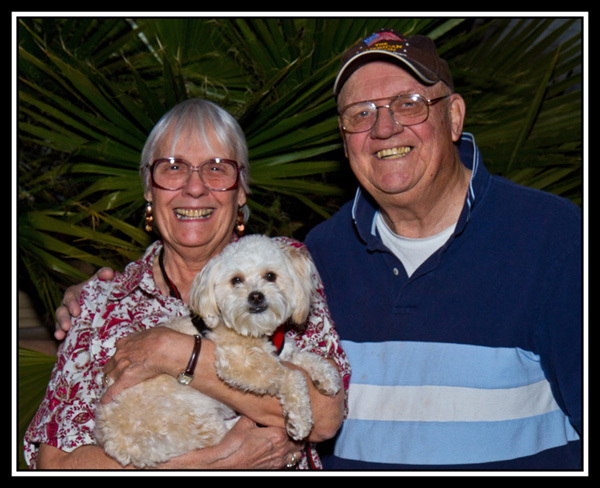 Dr. Huston, Sweetie’s cardiologist recommended that her heart defect be repaired. Surgery to correct this defect is scheduled January 14th. In the meantime Sweetie is happily residing in a foster home Sarah Stangeland and her family. Snickers was evaluated again in January by a neurology veterinary specialist and deemed to be a dog without further need of any medical tests. This happy little fellow was a big hit at an adoption event by greeting everyone and enjoyed being held by visitors. Snickers was adopted! 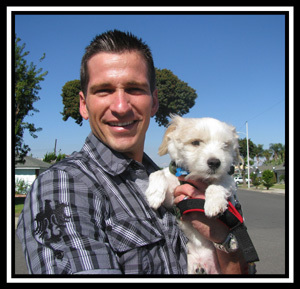 Snickers was taken to an LA Shelter by his owner when he could not walk as his front legs were stiff and extended. 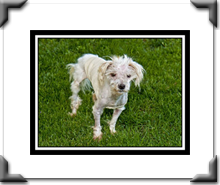 The shelter vet started Snickers on prednisone and his condition improved dramatically, and he was soon walking. 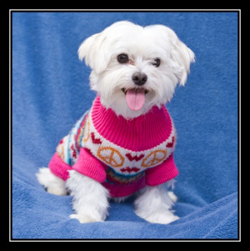 AMA Rescue was asked to accept this very affectionate, happy little 6 year old Maltese. Snickers was transferred to AMA Rescue and is now residing in a foster home. 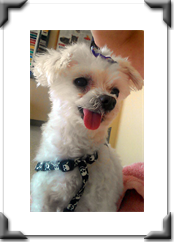 This happy little Maltese was examined by a neurological veterinary specialist with a recommendation for an MRI and spinal fluid exam to determine the cause of his neurological problem with his front legs as the origin is felt to be in the cervical spine of his neck. These tests are being scheduled. Marty was examined and had x-rays the end of January. His previous injuries are just about healed. Marty is now enjoying gradual increased activity and loves the freedom to explore the yard. He has certainly been a very patient young dog to adapt to confinement while his hip healed in the correct position. 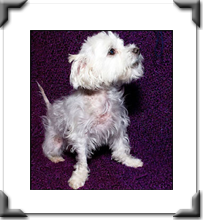 Marty is a young 3-4 year old Maltese male who was probably hit by a car. Marty was in a Los Angeles shelter with a dislocated hip. 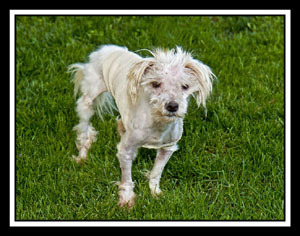 As a shelter partner, AMA Rescue picked up Marty and took him immediately to the Veterinary Care Center in Hollywood. Marty’s hip has been realigned to its correct anatomical position. He has remained hospitalized to keep him immobilized and allow adequate healing of his hip. 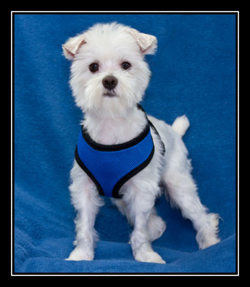 Emerson was adopted last month by a San Diego family with another Maltese. Emerson now has two devoted adults to give her lots of attention as well as follow-up care with her eye doctor in San Diego. On a recent eye exam, Emi was diagnosed with chronic dry eyes so she is now getting prescribed eye drops to help her eyes. So far the graft over her large corneal ulcer is healing nicely. Emerson is now learning some basic commands and how to be a household pet. This little girl will be available soon for adoption. 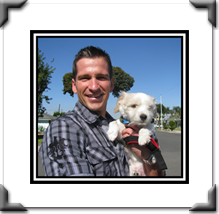 Emerson and another Maltese were confiscated from an owner on Oct. 27, 2012 and held in a Southern California shelter as “court evidence” until their release to AMA Rescue on Dec. 27, 2012. Emerson was immediately taken to Cypress Animal Hospital for badly needed dental care and a spay. Her left eye was a dull gray and badly infected. She was immediately started on eye antibiotics and taken to a Veterinarian Eye Specialists. In an attempt to save the vision in her left eye, immediate surgery was recommended and performed on January 6th to apply a graft to a very large and infected cornea ulcer. 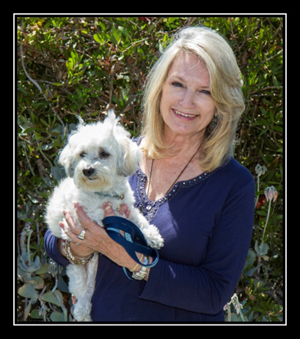 Emerson, a very affectionate, 5 lb Maltese is recovering and receiving several eye drops throughout the day with foster mom, Judy Crowe. Three little dogs were found in a field, in a homemade crate with a plywood bottom. It was filthy inside like they had been living in it for weeks. 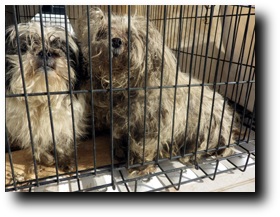 Their coats were severely matted with dried feces and urine. These dogs went to Petaluma Animal Services (PAS) in Northern California where they were cleaned-up and their medical needs attended to. To remove the horrid matted fur, they all had to be shaved to the skin. Two looked to be Shih Tzu and the other a Maltese cross. 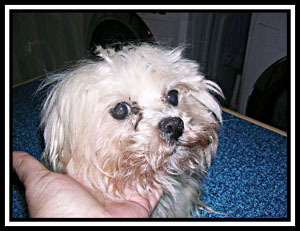 PAS is one of our shelter partners, and contacted us to ask if we could foster the little Maltese cross. 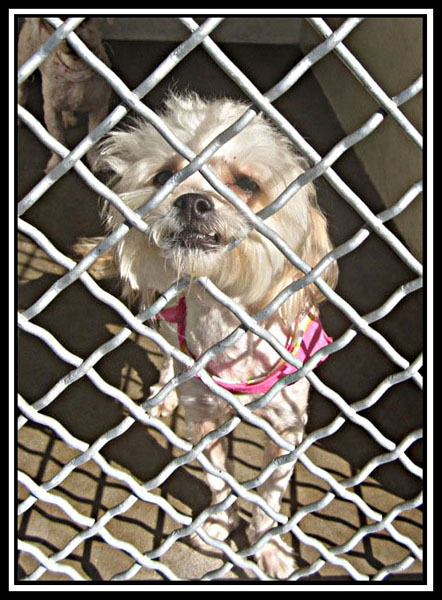 Our Northern California Coordinator fostered the little dog for PAS until the Stray-Hold time was up. Then, she was turned over to AMAR. The other two little dogs ended up getting adopted by PAS staff. So this little sweetie came to AMAR. She got a name, Lucky Penny. She proved to be the happiest little dog, despite the Hell humans had put her through. Her hair grew back and she had the most magnificent beautiful fur imaginable. She never stopped wagging her tail. 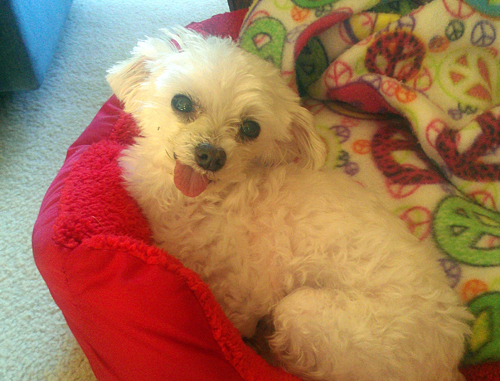 She played with other little dogs and blossomed into healthy girl. Penny lived up to her name and found the PERFECT Forever Home. She now lives near her foster home in a condo as an only dog, getting all the love and devotion she deserves. 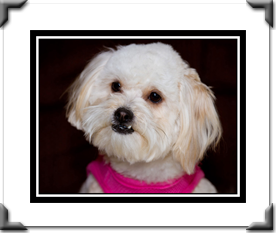 She will go everywhere with her new mom and enjoy play-dates with the foster family dogs. We just love Happily Ever Afters!!! Millions of people have been moved by the love and devotion in this video. 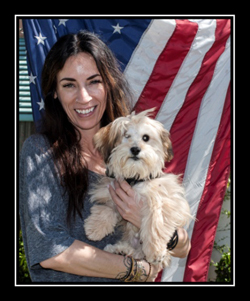 Did you know that is American Maltese Association Rescue saving that little dog, Edie? 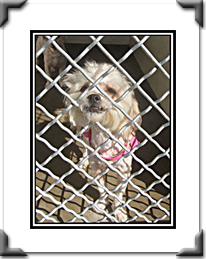 When our AMAR representative, Bronwyne, saw that little dog, she recognized the potential. She enlisted the expertise of Eldad Hagar to help evaluate. But that is not the end of the story. 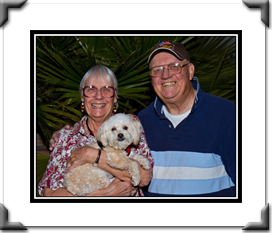 Bronwyne fostered this little dog and named her Edie, after our National Director. She went on to find a fabulous Forever Home, as shown in this follow-up video.